Me, Michelle Shocked & Ginny (a Lefty) at The Campfire Show International Women's Day, Hollywood, 2003. In 2001 I began drawing exclusively with my non dominant left hand. I called these drawings 'talking heads' because they all had funny little names and no necks. Five years later I had enough Lefty drawings to inhabit a whole world and I had completely lost track of which hand I was using when I picked up a brush or pen. I like to tell people that I began the Lefty Series because my overly dominant right hand lost it's sense of humour, but really I just needed to shake things up a bit. Left handed people are disproportionately represented in the creative professions - Turning on the right brain is a skill and one that grows stronger the more you work at it ~ Martha Beck, Oprah Magazine. A Lefty drawing & a Polaroid of Donna posing as a Lefty. - Guided by a dream I turned my Lefty drawings into an oracle card deck for giving online psychic readings. Over a five year period of painting more than 500 Lefties I discovered that my psychic abilities were increasing to the point where I just HAD to share these gifts by giving Creative Soul Readings. - Participated in a six month long psychic-mediumship circle or English Traditional Healing Circle to hone and develop my intuitive skills PLUS overcame a lifelong fear of merging onto freeways (at age 42!). - Started writing poetry again. I created projects such as Gadfly, a series of Lefty Chapbooks that morphed into Songs of the Lefties, a Postcard Zine (sixteen issues in all with monthly subscribers) and a book titled Odds & Ends - A Collection of Friends - Recipes, Rhymes & Incantations. - Started a Writer's Group to meet writers and showcase the Lefties. The group became quite popular and was featured in the local newspaper. Action words for right brain thinking: compassion, an open heart and a willingness to be supportive, joyful and at one with the universe. - Started signing my art as Kathy Crab rather than Crabbe and introduced myself as 'Kitty' at various writing events - it just fit in a Lefty kinda way. - Invited by Los Angeles musician and activist, Michelle Shocked along with Martha of The Muffins, an NPR (National Public Radio) talk show host, and the Radical Teen Cheerleaders to speak out about our art processes at Michelle's 2006 Campfire Series in Hollywood, California in celebration of International Women’s Day. I was absolutely terrified when Michelle first suggested I speak to a large group, but then she introduced me with her song, 'When I grow up I want to be an old woman' and I was just fine. 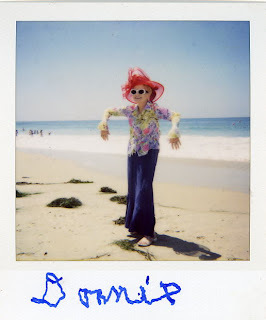 - Began a performance art project during which I snapped Polaroids of local people posing as Lefties (see Donna in the photo above) and had them sign their Polaroids with a funny nickname while using their non dominant hand. 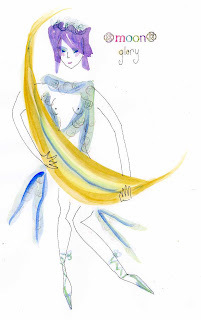 - The Lefties offer guidance to students of my Divine Feminine eClass being offered at the Wise Woman University online and in person in lots of other places where they are known as Moon Muses. They are intuitive guides and question askers that offer insight and wisdom along with exercises to heal and inspire. I will always call the Lefties best friends. They continue to inspire, amuse and guide us all. I feel that many spiritual practices and people are lacking in humor. Many of us long for laughter and lightness to express our inner joy and playfulness so that's what myself and the Lefties are here to do. "Zen-like" ~ Mary Fleener, Cartoonist. The Creative Soul Guides gently and intuitively encourage us to face our fears and experience creative breakthroughs. You can check out loads more Lefties on Flickr, order a Creative Soul Reading here or purchase your favorite Lefty originals and prints here.